Learn a new skill with us at Pork Ewe! We like to think that stepping through our squeaky wooden door into Pork Ewe Deli is like stepping into a little slice of Europe, right here in Mayfield. Rustic European charm fills the space and makes our deli a wonderful location to spend a few hours learning new cooking skills and techniques. We run a variety of cooking classes in conjunction with Rita Dixon who is the cooking phenomenon behind My Father’s Table, her very own Middle Eastern style cooking school. Rita’s passion and expertise make her a wonderful teacher and host. Her classes are fun, informative and interactive. Each class has a maximum of 12 people so everyone can enjoy one on one time, ask questions and genuinely relax and enjoy themselves. 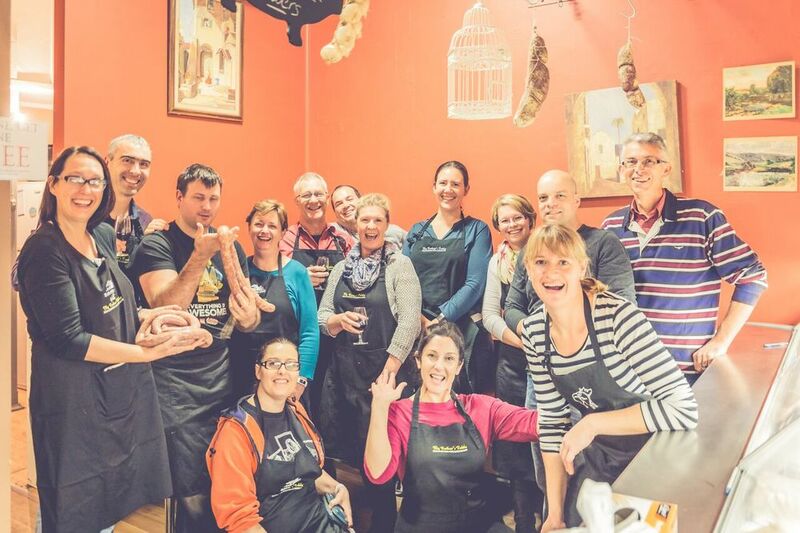 With a shop full of wonderful European ingredients that many people have never seen or heard of, our cooking classes are a great way to enter a new and exciting world of flavour and food. So, why not come along to one of our cooking classes, meet Shannon, Lisa, and Rita, make new friends and eat some amazing food... You’ll love it, we promise!